Don't spend Trail Notes at Independence or on the trail. They will be much more useful in Oregon City. Metate - reduces food usage but only very slightly. I traveled 56 miles with 150 food, without it 50 miles on 150 food. Winter clothing - protects you from frostbite but frostbite is one of the things which has to be cured for an achievement and it seldom occurs anyway. Buy it only to complete the 'Fasionista' achievement. The bartender in the saloon will give you game hints. You'll also meet many people who will give you quests. Lemons stack buy up to 10. When you start each trail section there's often something to find behind the wagon. For a very short time it's visible as the wagon passes it. Most people miss it. You won't find items within 20 miles of your destination unless it's a trip of less than 20 miles when you'll get one found item. A quick way to accumulate coins, energy, food and stamina items 'Found on the trail' is to repeatedly travel between Independence Rock and Devils Gate. This is a very short trip - 10 miles so watch out for the found item appearing behind the wagon. Starting pistols stack 3 to a slot. Use them for extra speed. If your animals spook - great! hang on and enjoy the extra speed. Keep an eye on your energy. If it gets to the maximum do some searching or you will waste it. Cotton is probably the best trade goods to buy since you can stack 5 of them in one slot and buy unlimited cotton in Independence at $75. The necklace earns slightly more but can't be stacked and is often not available. The most profitable item is the Giant Grizzly fur but only if you are traveling as the fur trader and have the ceremonial skinning knife. Both the necklace and giant grizzly pelt are vulnerable to being lost to bandits/rivers/floods. Searches vary for different people. Just because one person gets poor results in a location, it doesn't mean you will not get good results. Experiment to find your good areas. Visiting the trail doctor at a fort/station is a quick way of finding out the state of your team's health - even if you intend to cure them yourself. There is a really deep and wide river where you really need to pay the ferry. There are sinkholes where you'll find the best option is to swerve at the last minute - and lose a team member. Searching is largely unproductive - worth doing only to level up. To make the best of this ensure you have a teacher in the team when you start from Independence. Make sure you use chicken soup and apples before you start to keep health high. Make sure you have lots of stamina boost items before you start. If someone falls ill, cure serious diseases and delirium (use herbal cures which you've found before starting), ignore fever, snakebite and injury. Keep an eye on health and use herbal tea to restore it - again have a stock of these found on the trail. When you run out of stamina use the stamina boosts available on this board and grave posts from your wall. Do the same for food. Start in March with no rations bought - but have with you either found or bought food such as hardtack, flour, eggs or dried fruit. You'll also need a health cure (best is herbal tea) and the means to cure illnesses (best is herbal remedy). DON'T hunt for food when you run out. When the last team member dies use a small amount of food from your inventory and apply a health cure. Travel at normal speed - you can now collect food on the trail as well. When you get sick - if it's not dysentery cure it immediately. DO NOT CURE DYSENTERY! Stop collecting food or using it from your inventory. Stop hunting. If you get a buffalo hunt - miss and stop the hunt early. Go back to running at grueling pace to use up your food quickly. You'll find when you run out of food you will rapidly die of dysentery. Using the mini games will not delay you - unless you run out of food or have your wagon break down. Carry extra food as hardtack, flour, dried fruit or eggs to avoid running out of food and repair your wagon before it breaks down. don't stop to heal sick but carry herbal tea to heal your last surviving team member as a buffer to keep you healthy. 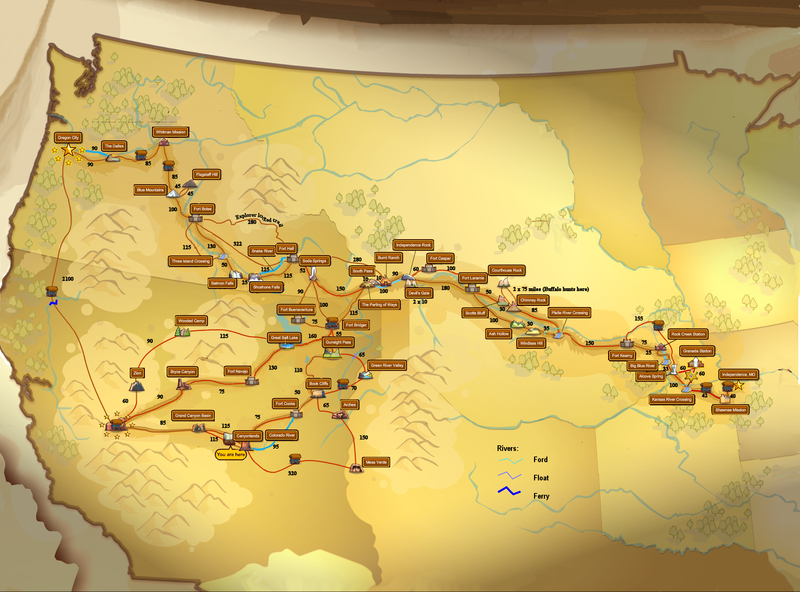 use the shortest route BUT take the southern route from Fort Laramie to avoid buffalo stampedes (20 miles longer). You may still encounter them but it will be less often.